On my side I just did few tests, but not enough to get a strong conclusion. However I can say I don't achieve the same performance that I get using a "medical grade" device. The signal is much more noisy in my opinion. By tuning the scenario and the acquisition, we managed to get some interesting results though (for example, around 8 letters out of 10 on a P300 speller run). We did not spend much time on it I'm afraid. I hope to do more tests once we get a new device (the one we have is broken). I am definitely not an electrical engineer... can't help you about the impedance part. In our research lab, where we normally work with gelled electrodes, we build some BCI games for the EPOC to demo at events. The strongest EEG signals, namely alpha-band power and SSVEP can be picked-up reliably with the EPOC. I've heart multiple reports that the P300 potential can also be detected. You quickly run into trouble with more interesting, but weaker EEG signals though, such as imagined movement (ERD/ERS). Alpha band-power can be seen when the subject is relaxed. It helps to close the eyes. It is a strong ±10Hz sine wave that should be visible when looking at the raw EEG signal. It is a sort of idle rhythm of the brain, and I like to envision it as the engine of a car when in neutral gear. The more active the brain becomes, the more signals interfere with the alpha rhythm. I think the Emotive software has an output for alpha-power called 'meditation'. Perhaps I can comment some more on the Emotiv hardware. There is no doubt in my mind that the EPOC can read EEG signals, but it is the amplitude accuracy that is questionable. I would have preferred a sampling rate of 256SPS, rather than their 128SPS, but this lower rate is certainly adequate. I think the hardware is quite capable to run at 256SPS and that the lower sampling has been chosen for reduced current consumption/longer battery life. The resolution of 14 bits I regard as “good”. I have seen complaints about noise. Unfortunately I cannot measure it because my standard EPOC does not allow access to the raw data. Judging by the circuitry, components and overall design, I feel that the noise performance will most likely be reasonably good. The noise would be easy to measure, short circuit one or more electrode inputs to DRL and monitor the raw data in BioExplorer. Using BE’s oscilloscope one could measure the peak-to-peak noise voltage, this would give the uVpp value. Using BE’s spectrum analyzer, and capturing the peak, would give the uVrms value. The uVpp is normally 6x that of the uVrms value (gausian noise distribution). NFB people tend to look at the raw signal’s 50 or 60Hz level to judge how good or bad the electrode contact is. If they see high levels of mains hum, they know that they need to re-seat the electrode, apply some more conductive gel, etc. A good contact is typically regarded as 5 to 10 Kohms. I suspect that the EPOC noise that people complain about might NOT be electronic hardware related, but rather the highish impedance (resistance) of the saline electrodes. Using the EPOC with prepped and gelled electrode sites will likely improve the noise performance substantially. The one question I am asking myself is this: what is the typical contact resistance of a saline electrode? I don’t know. I cannot measure it because I don’t have an AC impedance meter. My guess is that on a good day one could expect, say, 50Kohms, but I might be waaay off. One thing is for sure, if those electrodes dry out, that resistance will easily go up to 100s of Kohms and into mega-ohms. I was totally disgruntled with the EPOCs contact check. I found that connecting a resistor of up to 1Mohm still had the Emotiv indicating a “green electrode” – i.e. “good” contact. But I must hasten to say that this was a single channel measurement. Depending what is done in the EPOC’s embedded software, if multiple electrodes are connected, this might improve things – even drastically. In summary, I regard the EPOC’s sampling rate as adequate, the resolution as good and I suspect that the noise levels are quite “reasonable”. Although EPOC has 50 and 60Hz digital notch filters implemented, I suspect that real-world noise experienced could be high due to the use of saline electrodes. My biggest problem is with that low input impedance; this will make EEG signal amplitude measurements a hit-and-miss operation, especially if the electrodes dry out. Frequency measurement will not be affected. I initially thought of dumping the dsPIC33 firmware (embedded software) and writing my own, so that I could get raw data from the $300 EPOC. I know that there is a software hack, the so-called “Cody’s Emokit”, but replacing the embedded code would give me better access with the lowest possible propagation delay. (Software layering on the host can only delay the signal more.) It would most likely be possible to get 16bit 256SPS data from the device. Another reason for this route is that I expect Emotiv to modify future versions, to prevent the Emokit from working. Unfortunately, the current EPOC does not have a bootloader that would allow easy firmware changes without having to open the device, and with that low input resistance, I decided not to waste my time in rewriting the firmware. Rather, I plan to develop a 8/16 channel device from scratch. thank you for your very insightful post. I suspect the problems most people complain about with the emotiv device (qualified as noise) is actually electrode contact loss. This happens quite usually with my device at locations such as T7/T8 for instance, when swallowing or even moving head. Such contact loss cause DC offset and have very bad behavior in temporal filters, causing later analysis to be complete crap. In such condition, one should be able to either discard the epocs or to correct them in order to have better performances. I look forward to having news from the 8/16 channel design you are preparing. There is an official Linux research kit from Emotiv now! I was able to download it. I will try it today! We need to write an OpenVibe driver for it though. I have been asked (back-channel) about possibilities of modifying Emotiv by “detaching” some of the electrodes so that these may be applied to the mid-centre or other positions not reachable by the EPOC spider legs. Rather than replying back-channel, I will do so here for the benefit of other community members. 1. Remove 2 (or as many as you need) electrode holders. 2. Remove the golden metal cup from the electrode holder(s), on my unit these are simply pressed in. The removal is necessary to prevent melting the plastic holder during soldering. 3. Tin the inside of the cup. Tinning is simply wetting the cup with solder. Use decent quality solder, preferably solder with 1mm diameter or less. Note - the outside of the cup must remain clean and free of solder, because it will still have to mate with the spring-loaded fingers on the EPOC’s spider legs. 4. Solder a thin multi-stranded wire (use 24 or 26 gauge) to the cup inside. I would recommend a wire length of approx 12cm from cup to the electrode that you’ll fit on the other end. That should be enough reach. A too long wire will just pick up more noise and interference. 5. Refit the cup back in the electrode holder. Now remember that the fitted wire is likely to pull the cup out, especially since no electrode felt will be used. I would not recommend gluing. After a lot of use, the wire is likely to break at the point where the solder wicked into the multi-stranded wires. If the cup is glued, you will possibly melt the plastic if you need to re-solder. 6. I would try filling the cup with silicone and allow the silicone to also adhere to the plastic holder. This way you protect the wire from breaking and at the same time the silicone will “glue” cup and holder together. Silicone is a mission to remove, but it can be done. Not so with most real glues. Alternatively, just for a quick test, you could consider pressing some prestick into the cup. OK, so now you have converted an electrode holder into an EPOC compatible “plug” with attached wire. You didn’t break or damage the EPOC and with careful work, you could even undo everything. Now you need a replacement for your electrode which you have just “lost”. I am not sure if Emotiv sells replacement electrode holders, but even if they did, that would not help much. You would need the mating part as well. And that you will certainly not be able to buy. Rather than stuffing around and try to build your own saline electrodes, I would recommend buying some proper Ag/AgCl electrodes. Although one should not mix electrodes with EEG equipment, here is an exception. Emotiv has AC coupling input capacitors that will block DC half-cel voltages. So using Ag/AgCl should be fine. One typically only needs 2 or 3 electrodes over the centre line and those I would stick down with Ten20 conductive EEG paste, as used by professional NFB practitioners. The professionals normally do site prepping as well – this I would NOT do. Site prepping reducing the contact resistance which is good. However, all the other electrodes are of the lousy performing saline type. They are already at a disadvantage and those sites are also not prepped. I would prefer these new, non-standard electrodes not to have a significant lower resistance as that could create more problems. As you should know by now, I have nothing good to say about the EPOC’s input resistance! So that will only leave you with one more problem. How to attach the wire to the Ag/AgCl electrode? Ah, with great difficulty! I am not going to write a book here, there is no easy answer/solution. On the wire side-entry electrodes such as the plastic disposables, you could attach the wire by simply winding tightly over the pin and then placing heat-shrink tubing over it. Or you could try conductive glue. The clip-on electrodes are more challenging. You could buy some button clips at your local haberdashery. They work sort-off but it is not a perfect fit. You will also struggle to solder onto those buttons. It is far from ideal and I offer these ideas more as a starting point than a solution. Note that I have not done such a mod-job like this myself and this advice is thus only academic. I have been researching about the Emotiv EPOC (EEG version) for my personal use in Neurofeedback self training. Stefanj's definitively negative view on Emotiv EPOC and his disapproval of it had been widely quoted in many NFB forums, many potential buyers of Emotiv EPOC were dissuaded from buying an Emotiv EPOC for EEG NF applications, myself included. 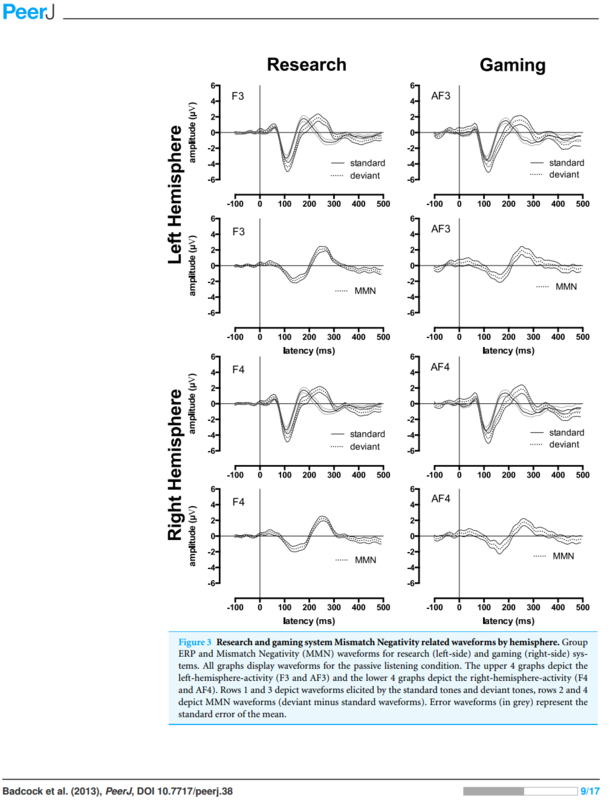 Considered together, the results of this study suggest that the gaming EEG system compares well with the research EEG system for reliable auditory ERPs such as the P1, N1, P2, N2, and P3 measured at the frontal sites. In the future, Emotiv may also prove useful for measuring less reliable ERPs, such as the MMN, if the reliability of such ERPs can be boosted to the same level as late auditory ERPs. 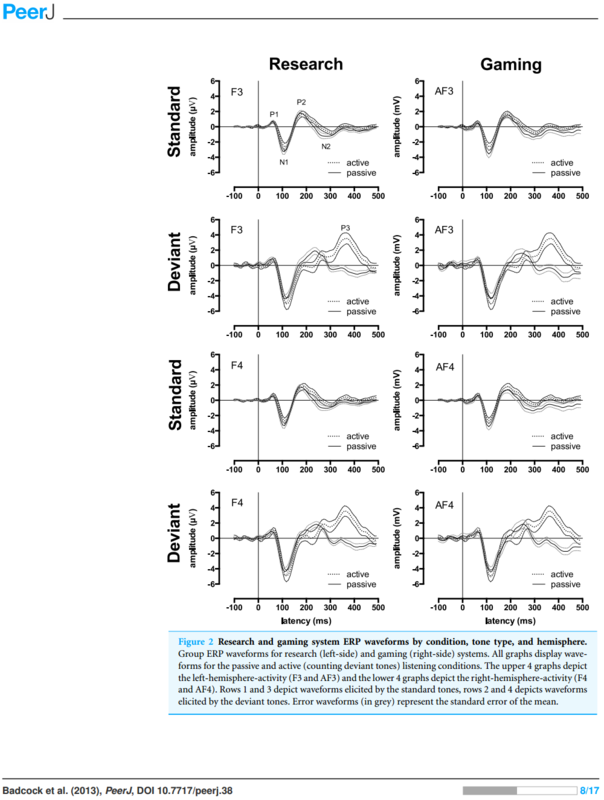 The apparent validity of the gaming EEG system for measuring reliable auditory ERPs, paired with its quick and clean set-up procedure and its portability, makes it a promising tool for measuring auditory processing in people from special populations who are unable or unwilling to be tested in an experimental laboratory. It may also open up new avenues for research since, in principle, the gaming EEG system can be used anywhere (e.g., schools, homes, shopping centres, hospitals) to measure brain responses in children and adults. PeerJ provides academics with two Open Access publication venues: PeerJ (a peer-reviewed academic journal) and PeerJ PrePrints (a 'pre-print server'). Both are focused on the Biological and Medical Sciences. Q&A + annotations provide a second route to gaining credit for knowledge-share. Bobrov P, Frolov A, Cantor C, Fedulova I, Bakhnyan M, Zhavoronkov A: Brain-computer interface based on generation of visual images. Mayaud, L., Congedo, M., Van Laghenhove, A., Orlikowski, D., Figère, M., Azabou, E., & Cheliout-Heraut, F. (2013). A comparison of recording modalities of P300 event-related potentials (ERP) for brain-computer interface (BCI) paradigm. Neurophysiologie Clinique/Clinical Neurophysiology, 43(4), 217-227. Van Vliet M, Robben A, Chumerin N, Manyakov N, Combaz A, Van Hulle M: Designing a brain-computer interface controlled video-game using consumer grade EEG hardware. Stytsenko K, Jablonskis E, Prahm C: Evaluation of consumer EEG device Emotiv EPOC. Proceedings of the MEi:CogSci Conference 2011. I haven’t checked out this forum for a few months now and sadly, I haven’t had much time to devote to my interest in bio-engineering in general, and specifically in EEG technology. I just read the comments from Beginner, regarding that paper on Emotiv. Apparently I have “casual opinions”. Perhaps I can add some more. I think we are living in a very sad world. My respect for scientific research papers in most industries has flown out of the window. Here is the thing. EVERYTHING, and I really mean everything, in life revolves around MONEY. Yes, it has always been like that, but today it somehow feels worse than ever. You take the evil empire that is Monsanto and big Pharma. Between them, they have the FDA and all sort of other US organisations in their pockets. They are the perfect spin doctors. Not hundreds, but thousands of papers are published to promote their GMO poison and chemical pills. Any individual that stands up, or publishes a paper that is damaging to the industry, will be threatened, sued, mocked or worse. Far worse. Modern day witch hunts against those that dare to deflect potential $$ income. Read up on Dr. Stanislaw Burzynski. Read Beckers book “The Body Electric”. Read Robin’s book “The World According to Monsanto”. Read Patrick Holfords many publications. Follow Dr. Mercola. Just to name a few. Research organisations need funding and you will more often than not, find that a researcher has some sort of link to some or other pharmaceutical, or other company. So the truth gets bent or totally mis-represented in a way to promote the backing company’s interests. Papers have been published that used statistical analyses with such basic logically flawed methods, a college student doing Stats 101 would know better! The problem is often compounded by other researchers that use such ill-conceived research papers as a base, to do further research. You then get a whole series of research papers, often stretching over a few years, all based on flawed, purposefully misrepresented, doctored and falsified data. One bad seed can tarnish further work, sometimes causing reputational harm to researchers later on; people that were not aware or part of the original fraud. Let’s take an example. I, as an EE, truly believe that all this wireless crap such as cellphones, WiFi, etc. has a detrimental effect on the human body. I came to this conclusion based on The Body Electric book. I would NEVER tolerate WiFi use in my own home, especially over long, extended periods. Fortunately I stay in a house with my own little garden, so if my neighbours run WiFi, I should be reasonably well protected, simply due to distance. Most of my engineering buddies laugh at me for these views. Well, they are welcome. Irrespective of you, the reader’s personal view, can we agree that any research paper that would concur with my view, would be damaging to a mega industry? Now, we HAVE had researches that published papers indicated the detrimental consequences of RF radiation. We also had a much, much higher number of research papers that claim that such is totally harmless. Well it is obvious. If every Nokia, Motorola, Samsung, Sony, Ericson, Blackberry and other communications company makes available a few million research dollars WITH “strings attached” the war is simply won by numbers. The minority researchers will be painted with labels such as freaks, tree-huggers, or whatever. 500 papers say there is no harm. 5 papers claim there is. Who do you believe? The sheeple will go with the majority of papers. Modern day free thinkers should question this. So, if you get hold of a research paper, look at the authors and the publishing house. But more important, try to figure out WHO sponsored the work. Sadly, the sponsorship will often be convoluted to confuse. Keep an open mind. Research dollars buys one a lot of smoke and mirrors to proof or disproof anything. The current GMO labelling war in the US is a good example of this. Although, the GMO war I refer to, has little to do with research funds. It is war money, plain and simple. But the concept is the same. For those BCIers that are still with me here, I apologise for wasting your time by posting way off the intended subject matter. I think that the openBCI project shows a lot of promise, but unfortunately it is nowhere to product ready. My own 8/16 channel amplifier design went as far as 1st hardware build prototype which was already concluded in early 2013. Sadly, I simply haven’t found the time to write the embedded software. It would be a waste not to press through, but at this stage I am still considering my options. Having bills to pay, I go for the low hanging fruit first. EEG equipment doesn't feature there. Or lets put this differently, the ROI in money and/or time is risky, much more so than some of my other activities. Just one question to Beginner here. If I am so ultra negative about the EPOC, why did I bother writing about how one could possibly modify the EPOC headset - WITHOUT destroying it? Have a look elsewhere on this forum where I explain a possible mod to allow for the reading of sites other than those defined by the EPOC spider legs. A lab environment is a beautiful place to be. You can control temperature, humidity, electrical radiated noise and you can define your length of time you want to measure. So you apply saline to the EPOC spider feet and you test for 3 minutes. Then you write your conclusions. And it all sounds wonderful. Now Gatiep here, buys an EPOC. But Gatiep is my neighbour in hot Africa. He wonders why the signal goes down the tube 10 minutes into his play. Well, dry heat tends to evaporate things, including good results! That, dear Beginner, is the difference between Heaven and Hell, er, between lab and real-world scenarios. I praise where praise is due and I am critical where I think I need to be. I have no financial or other links to any bio-engineering or gaming company. A true single little drummer boy, following my own drum. At least for now. Any bio-engineering Co. hiring? If Geoff pays me enough, I will sing EPOC praise all day! Pardon the casual opinions from this dude from Africa (South). Let me get back to my log-fire before the [Emotiv] boogieman gets me.